Convert DRM-protected Audible AA, AAX audiobooks to DRM-free MP3, AAC, M4A with CD quality so that you can enjoy any audiobook on Android phone and Tablet as you wish. AudioBooks on the iTunes store are provided by Audible, which is a subsidiary of Amazon. Audible has a wide variety of AudioBooks, much like Kindle has with eBooks. However, apart from iTunes and the official Audible client, the audiobooks are not playable elsewhere. Audible audiobooks come in .aa and .aax formats depending on the audio quality. Also, they are protected by DRM, means that you cannot play it outside a limited authorized set of devices. What if you want to play them on Android Devices with the default music player? Usually this is not possible. But, there is an app named Easy DRM Converter, that converts these DRM protected Audible audiobook AA, AAX files to MP3 allowing them to be played on any audio player, including your Android phone and Tablet. Let us understand how. 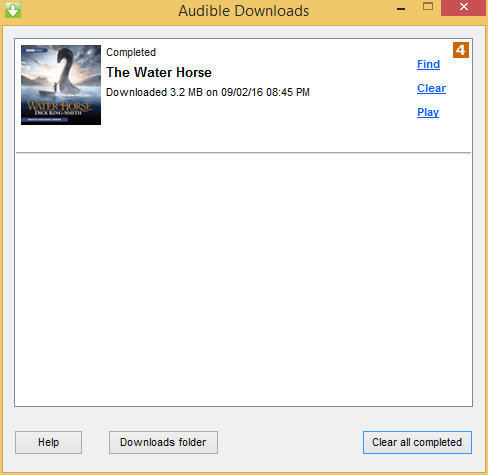 How to Converting Audible audiobooks to MP3 on Windows? If you are a Windows 7/8/8.1 or Windows 10 user, you will require an Amazon account, Audible Download Manager or There are some AA / AAX files can be played in iTunes, and the latest version of iTunes. 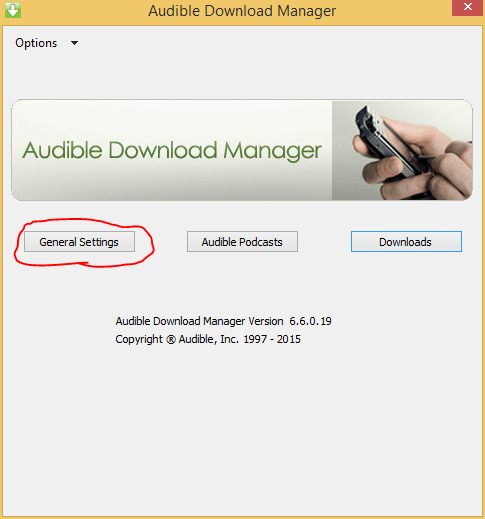 First of all grab the Audible download manager (ADM) from this link and install it. Run ADM from from the start menu. The ADM service will start running and you’ll see the icon on the taskbar. Double-click the icon. You will get this screen. Click the ‘General Settings’ button. A window will pop up like this. Checkmark the ‘iTunes’ box and click ‘Save Settings’. 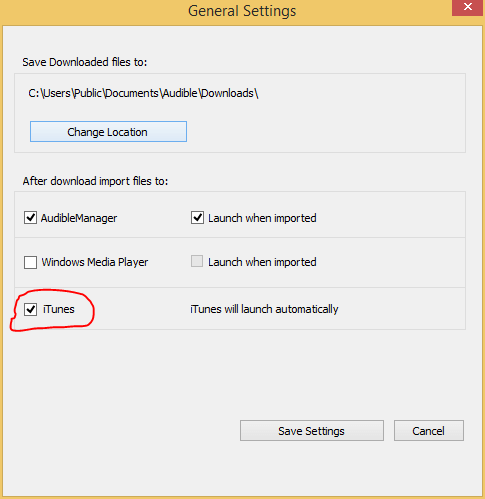 This setting will ensure that your Audible audiobooks purchases will be imported into iTunes when downloaded. 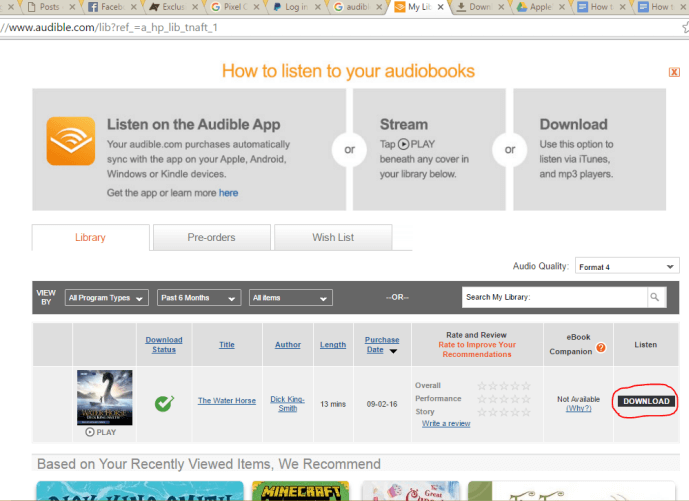 Then go to audible.com from your browser, log in to the site with your account, and head over to ‘My Library’. You’ll see your purchases listed. 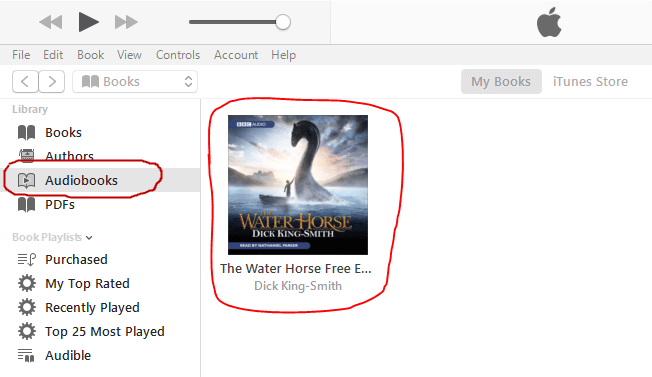 Click ‘Download’ next to the audiobook you want to download. An “admhelper.adh” file will be downloaded. Click on the download to open it. ADM will open and fetch the audiobook for you. It will even launch iTunes and you’ll be able to see the audiobook into the iTunes books library. You’ll be able to play it by clicking the play button and transfer them to iDevices. 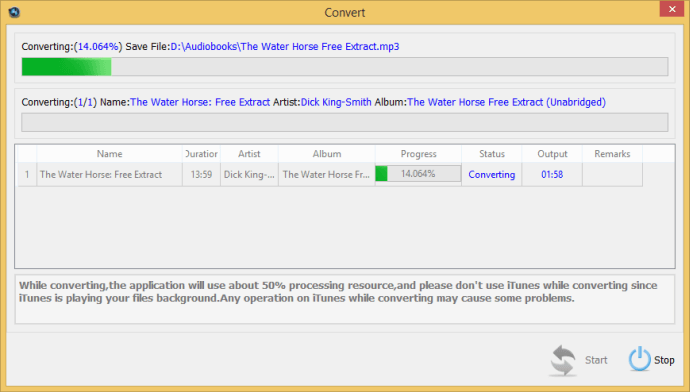 To convert purchased audible audiobooks for any android device, launch Easy DRM Converter at this point. 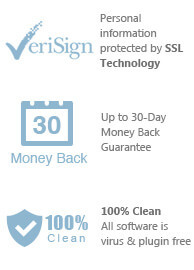 After opening the software, you can see the main interface as below. 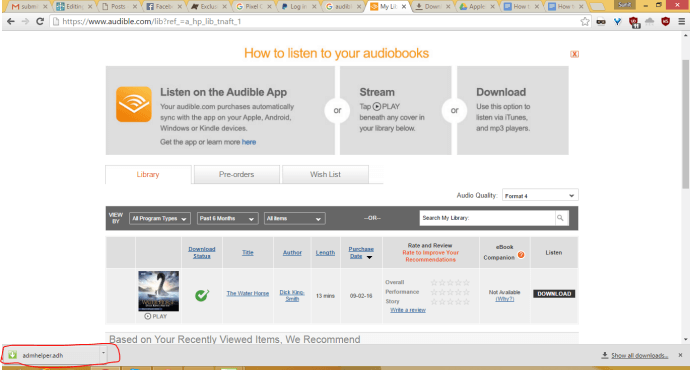 Click the ‘Audiobooks’ option on the left bar. You will see your imported audiobook listed. Checkmark the audiobooks you want to export. 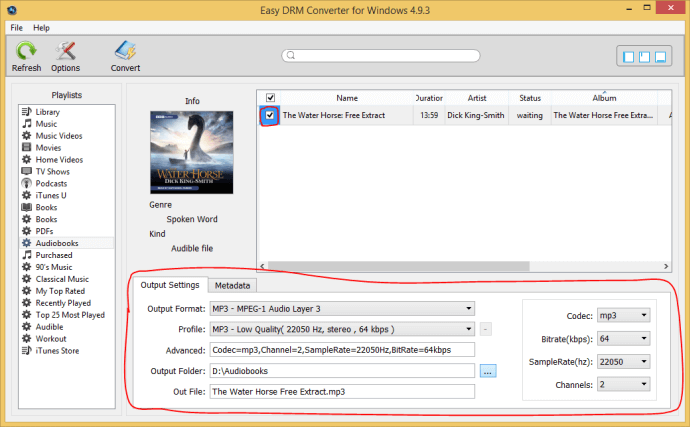 Then at the bottom panel choose MP3 as output format and browse to choose a folder for storing the converted Audiobooks. Since audiobooks are low bitrate voice focused tracks, you can choose low quality 64kbps MP3. After you have done all the steps above, click the "Convert" button to start converting all checked Audible files. The conversion starts and takes a while to complete. Once done, click ‘Explore Save File’ to open the folder where the DRM-free MP3 audiobooks is located. Now you can easily manage and transfer those audiobooks to your android devices. Easy DRM Converter is designed to help Windows users legally remove DRM from purchased audible in conjunction with iTunes. This frees you from the requirement of having the Audible app installed and also lets you play audible on any android device that Audible does not support. so it provided that the user is legally entitled to listen to the Audiobooks. You can immediately download free trial version of Easy DRM Converter from our website and start to convert your Audible audiobooks to MP3 right now !